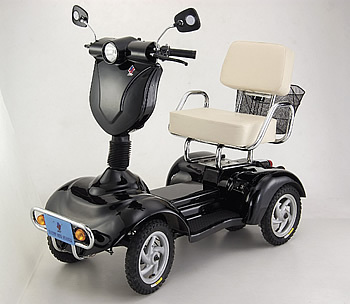 Description: 4 wheel battery powered scooter, Comes equipped with rear view mirrors, front and rear lights and storage basket. Size Length - 47.2" Width - 25.2" Height - 37", Weight 118 lbs, Tires 12 1/2" x 2 1/4", Aluminum alloy wheels, Battery 24V / 20 AH, Max speed 16 mph, Cruising range 19-22 miles, 24V DC motor, Charging system AC 110V-220V, Charging time 6-8 hrs. Max rider weight 264 lbs. Rear brake drum with front cantilever.